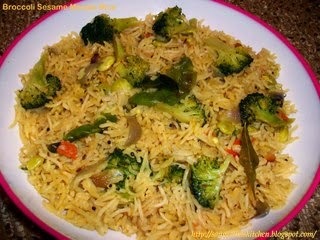 Mention khichdi and in most it cases results in noses wrinkled up and giving the "am-i-sick-to-eat-khichdi ?" look .. 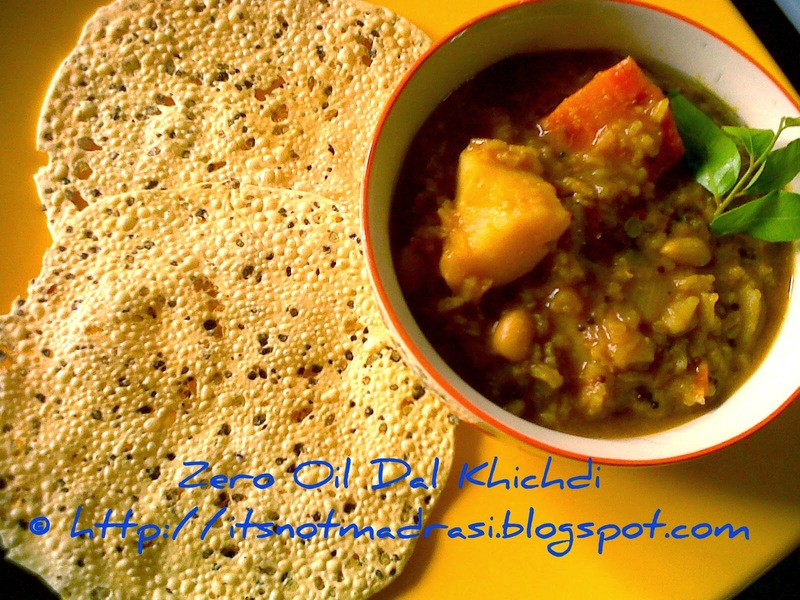 It has happened to me soo many times, but once you eat a spoonful of this Zero Oil Dal Khichdi, it appears as if the tantrums were baseless. 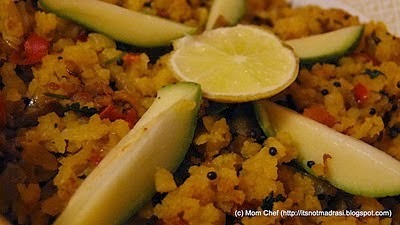 This morning got me browsing through Sanjeev Kapoor's No Oil Cooking, and there it was : a light but healthy Dal Khichdi. Totally fat free, loaded with proteins and goodness of vegetables, this is a treat both to the senses as well as to the stomach. 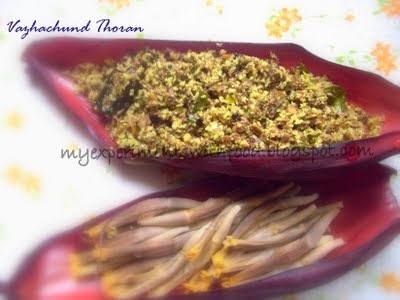 Just have it with plain curd / roasted papad, and you are good to go for hours ! 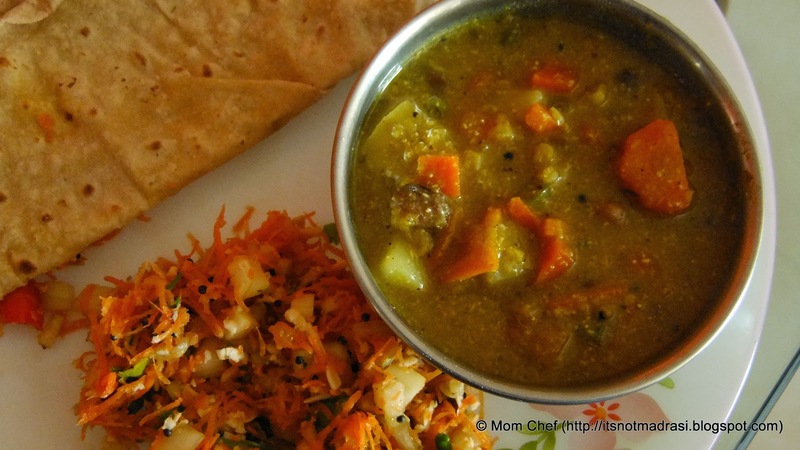 I tweaked the recipe by adding some mixed vegetable sambhar from the previous night, and this is a super healthy way to clean your refrigerator with useable food as well as a quick meal to put together when you are pressed for time, not to mention a One Pot meal loaded with goodness. The torrential rains in Mumbai, and the resulting water logging made commuting by road a nightmare - honking motorists, unfinished bridges and piles of concrete lying in the roadside - all contributing to anger snarls and a continual fight for space on Mumbai's rather wide roads : an all too familiar sight in India, perhaps? 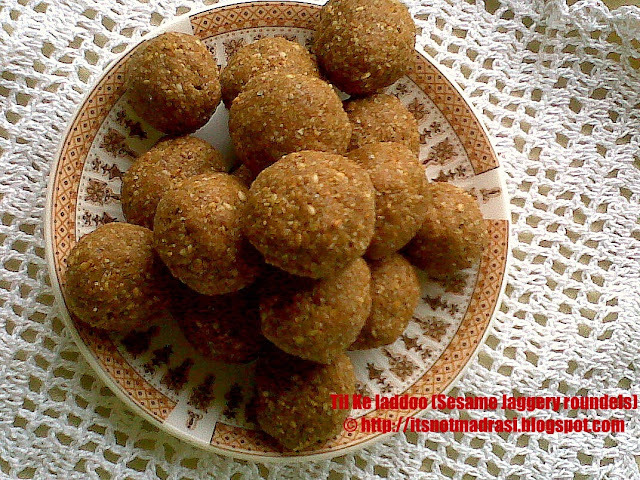 Til Ka Ladoo (Sesame Jaggery Roundels) aka Ellu Urundai (Tamil) / Ellu Unde (Kannada) is something that most households make - I asked mom to make some sweet , but with no sugar / oil ! Mom looked at me and said she would make Til Ka Ladoo mix but I would have to shape them into ladoos.. Now, shaping ladoos is something I have never done (yes, I am not into that : I am more a halwa / sheera / kheer person! ), but I reluctantly agreed. So she got the mix ready and I started shaping them - 9 of what I thought would be ladoos disintegrated right in front of my eyes, while mom was looking on - an amusedly wicked smile spreading across her face : I looked at her for some help while she looked the other way ! What would be life without Paneer, I often wonder - a versatile ingredient that lends itself to soooo many dishes, without hogging the limelight itself ! 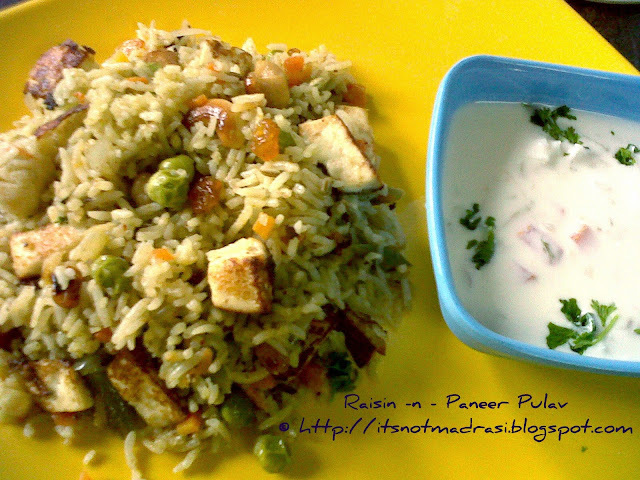 Almost absent, yet present .. wondering if I continue thus, I might end writing an ode to Paneer :-) (chuckle!). 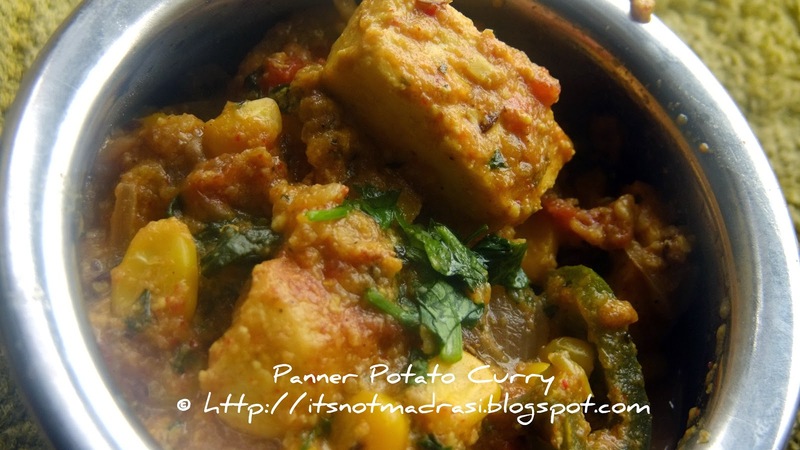 Today's dish - Paneer Potato Curry came out beautifully, ably referenced with Nita Mehta's book - More Paneer dishes , and is an entry post to Blogging Marathon's Day 4 under the theme "Cookbook Recipes". I slightly modified the recipe by adding potatoes and it came out wonderfully along with Phulkas for dinner..
See what my fellow marathoners are upto here. Priya's bookmarked recipes, Radhika's Subjis for Rotis along with my own event - Healthy Lunchbox Ideas - Paneer hosted by Jayashree. 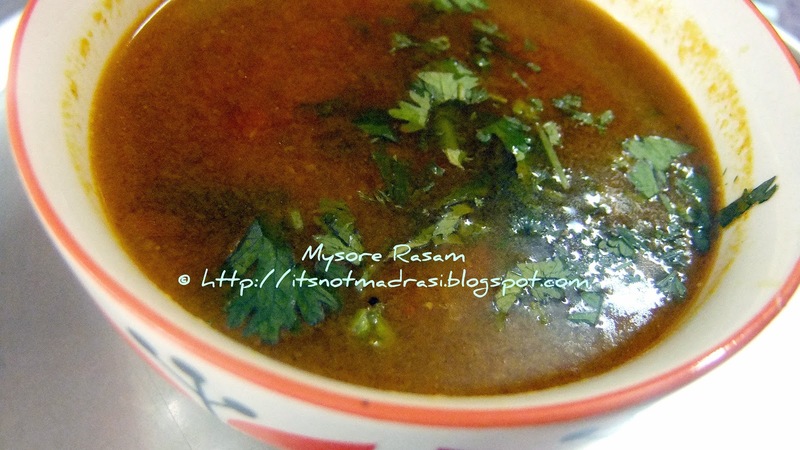 Continuing my series of Cookbook recipes for Blogging Marathon, I present from the book “Samaithu Paar” an evergreen classic – Mysore Rasam. Rasam by itself needs no introduction – it’s a comfort food, a staple in South Indian homes, and is part of any South Indian Thali worldwide. Rasam can be loosely translated as a broth, mildly spiced with just a hint of tamarind and with or without cooked lentils (toor dal mainly). My quest for "Cookbook Recipes" under Blogging Marathon's theme this week led to my old, and probably forgotten recipe book that came with my Electrolux microwave - frankly, I dont bake in my microwave and prefer the OTG, but this chocolate cake recipe caught my eye, however it contained both egg and butter. 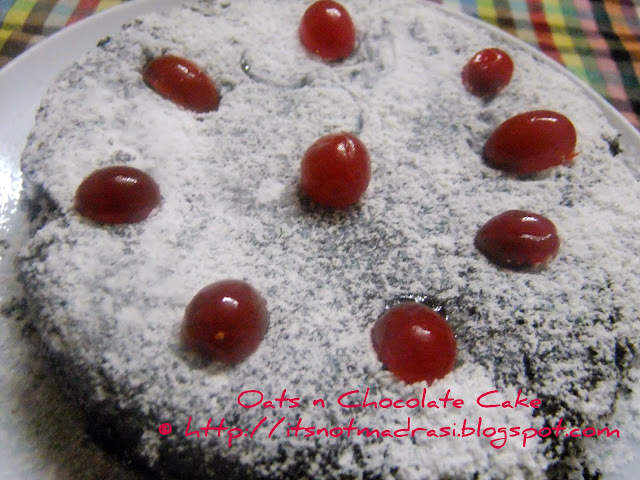 But I kinda tweaked the recipe a bit and came up with this amazing Eggless Butterless Chocolate Cake with Oats. One of the main sources of recipes till I married and moved cities was of course mom's recipes or some basic recipes cut out from magazines. Until I discovered there was a difference between sambhar and kozhambu (some terms that we used interchangeably back home, in a Mysore influenced Kannada-tamil cuisine at home, but not in my newly married home) !! It was harakiri to call Kozhambu as Sambhar or vice versa, I discovered in my Tamilnadu-palate seeking inlaws'. Mom was still 1200 kms away, and a long distance call wasn't always possible, so I looked around and by then Google was lifeline for me :-) But the net wasn't always on, especially while you cooked ! So, on a few friends' reco, hopped on to the nearest South Indian Store in Matunga and picked up Meenakshi Ammal's Samaithu Par - a treasure trove of South Indian Cooking. Of course, kiddo wanted cheesy dip to go with this, but I guess I had run out of patience by then.. You can of course refer to the very cheesy and melt-in-your-mouth dip here that I had earlier served with Baked and roasted Baby Potatoes. .Ummmmm... 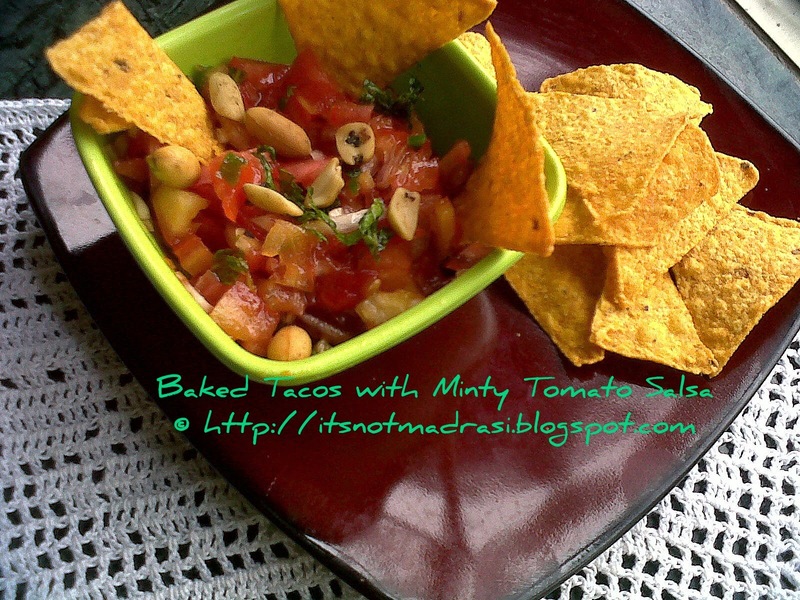 I had used store bought tortillas which I baked in an oven here, but you can make your own tortillas any time ! 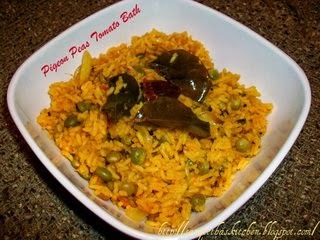 Spanish Cuisine I think is very close to Indian cuisine in terms of spice and tomatoes, and I guess I should endeavour more of this often :) This dish today is a superb appetiser that you can serve at any party too ! I LOVE capsicum / bell pepper in any form - tossed, fried, stir fried, curries, gravy, bajjis/ pakoras :-) S often remarks that my grocery shopping is incomplete without buying bell peppers, and I am happy to have passed on the infectious enthusiasm to kiddo too :) Last eve saw two bell peppers looking at me to be used up, and frankly I was in a mood to experiment, but on a low cal format. So, made this dish that I have been wanting to make for a longgggg time - Baked Stuffed Bell Pepper or in aam-aadmi language, Bharwa Shimla Mirch. I distinctly remember having been introduced to this dish along with Stuffed Tomato by my dad at a restaurant called Samrat in Bangalore's Race Course Road, many many decades ago, when eating out was considered a luxury. Instead of using a lot of potato, i substituted some of them with sproutsed moong, and it definitely turned out healthy and light too - I made these with halved bell peppers as they were big, but would be great if you can use whole mini bell peppers. We had these with Yellow Dal and Phulkas, but am sure it would be a superb combo with naans / khulchas. The fact that it was baked added to the taste and it was refreshingly comforting. See what my friends from Marathon here. 1) Boil, peel and grate potato . Boil moong dal for 10 minutes simultaneously.. Mix both these and add the dry masala powders, coriander, green chillies, shahjeera, black pepper powder, turmeric, salt. Mix and keep aside. 2) In a pan, add 1 TBSP oil and fry onions till brown . Add to the above mixture and mix again. 3) Meanwhile preheat oven to 210 C and scoop out and de-seed the bell peppers. 4) Lightly grease the insides and outer skin of bell pepper with oiled fingers - this is optional but helps the masala stick to the insides well, without running. 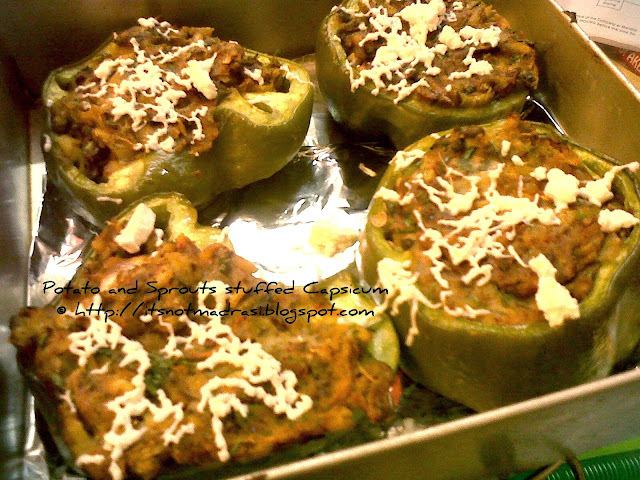 5) Stuff about 1 - 2 TBSP of the masala inside the scooped out bell peppers. 6) Line a square baking tray with foil. Bake at 210 C for 18- 20 minutes till the outer skin slightly shrivels (time depends on the size and quantity of bell peppers). 7) Remove from oven once done. Sprinkle grated paneer (or cheese) while its still hot, and serve with Rotis / Phulkas and Yellow Dal / Hingwali Dal for a complete meal. 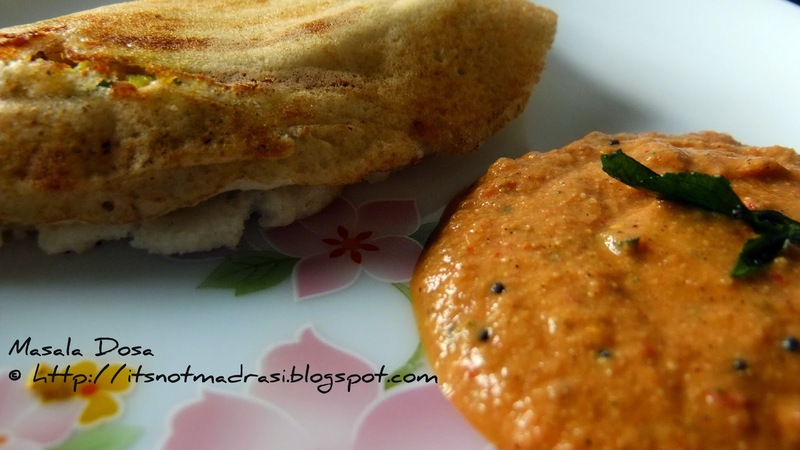 Today's combo meal is Masala Dosa with Spicy Tomato Chutney.When a friend from England recently asked me what it meant in English, I loosely translated it as Fermented Black Lentil Crepes - the name sounded strange to me too :). But to the true Udupi-fare loving foodie, Masala Dosa is the king of breakfast and good food in general. Down memory lane,I fondly remember my college / work days in Bangalore savouring good old Masala Dosa with Sambhar Chutney at the famous eateries -Vidyarthi Bhavan in Gandhi Bazaar or the Dosa Camp (Ganesh Darshan) at 4th block Jayanagar. We used to pay regular homage to these and many more such eateries who had Crispy Brown hot Masala Dosa as its USP. Before I trip on to any more memories, let's get to today's recipe . I learnt the proportion for this masala dosa from a neighbour back in Bangalore whose dosas used to send us into a tizzy with the warm flavours from her kitchen. 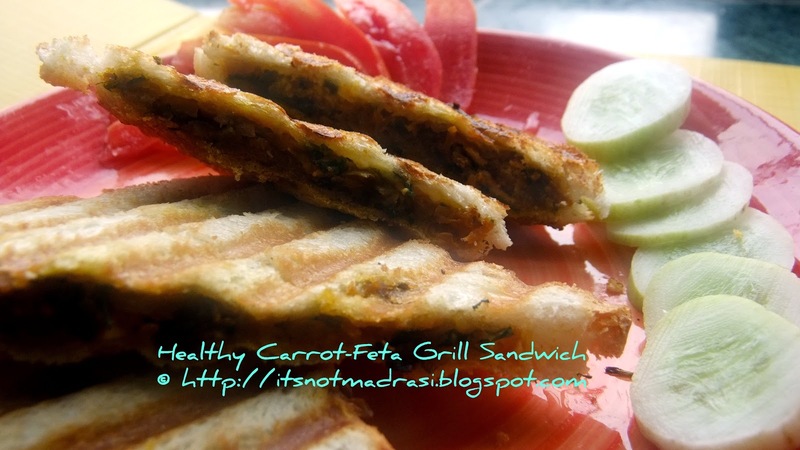 Good Food's Proteinicious and Divya's Show me your Dosa events. Prep time (excluding batter fermentation) : 45 mins - 1 hour. 1) Soak Urad dal + methi + channa dal in one vessel and rice separately in another for 4 -5 hours. 2) Grind to a smooth batter. Add salt and ferment overnight. 3) Next day, prepare the Dosa : Heat the tava. sprinkle a little water to check if its ready. Pour a ladleful of dosa batter in the middle and spread in concentric circles starting from the centre. Drizzle 1 tsp of oil around the circumference and let bake till golden brown. 4) Once done, flip over for half a minute - cook and flip back. 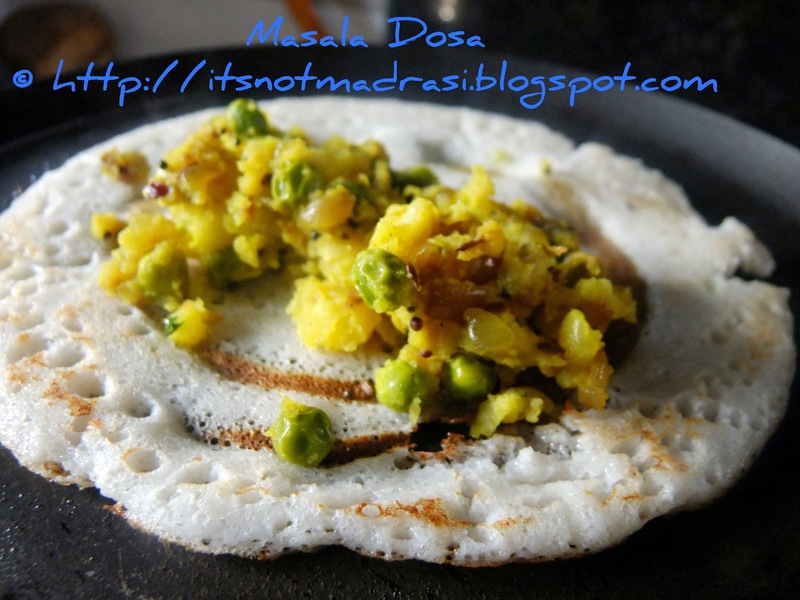 Add the potato masala (recipe below) and close the dosa over the potato filling. 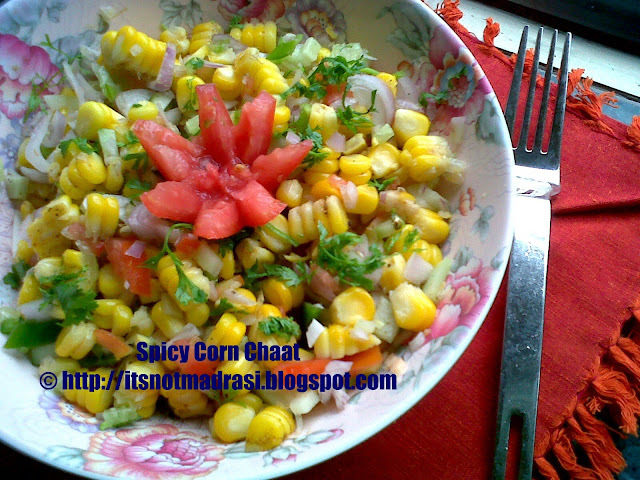 Serve with Spicy Tomato Chutney. 1) In a pan, heat oil. Splutter mustard seeds, urad dal, ginger, green chillies and curry leaves. 2) Add turmeric and sliced onions. Fry well till onions turn slightly brown / translucent. 3) Now add salt, boiled and slightly mashed potatoes and stir well. 1) In a pan, heat oil. Splutter methi seeds. Add Onions, toamtoes and toss well. Now add chillies and fry once more. 2) Add salt and cover and cook with 2 - 3 tbsp of water till tomatoes get slightly mushy and onions turn translucent. 3) Grind with salt to a runny consistency. If preferred, prepare tempering with mustard seeds and curry leaves and pour on the chutney. 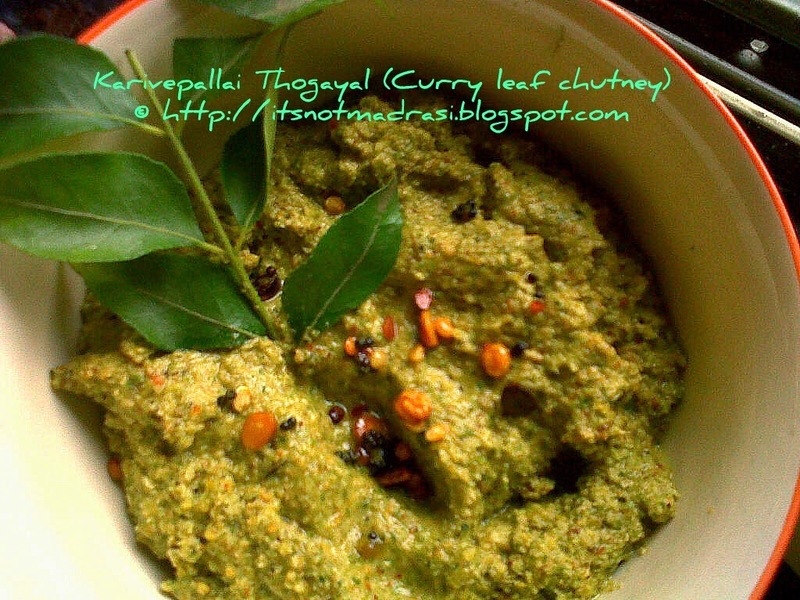 You can use this chutney with Dosa / Idli / Ragi Rotti / Adai Dosa / Kanjivaram Idli . Sunday lunch is usually an unhurried and elaborate affair, often a 3 course meal. 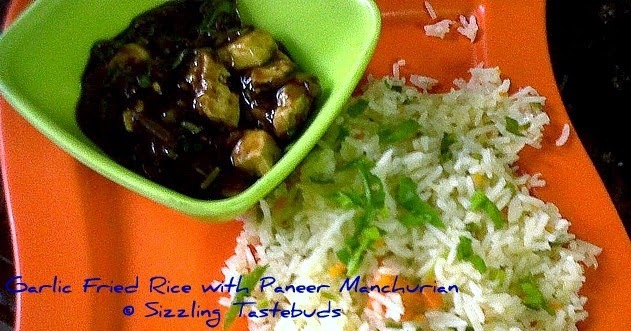 However, with S out this Sunday too, me n kiddo had this yummy Garlic fried Rice and Paneer Manchurian - a combo that never fails to deliver the punch and excitements for kids and adults alike. With the entire combo made in just 2 tsp of olive oil and no MSG and with carrots and paneer added, this is an extremely healthy meal to regular junk food dished out at restaurants / food courts at malls . 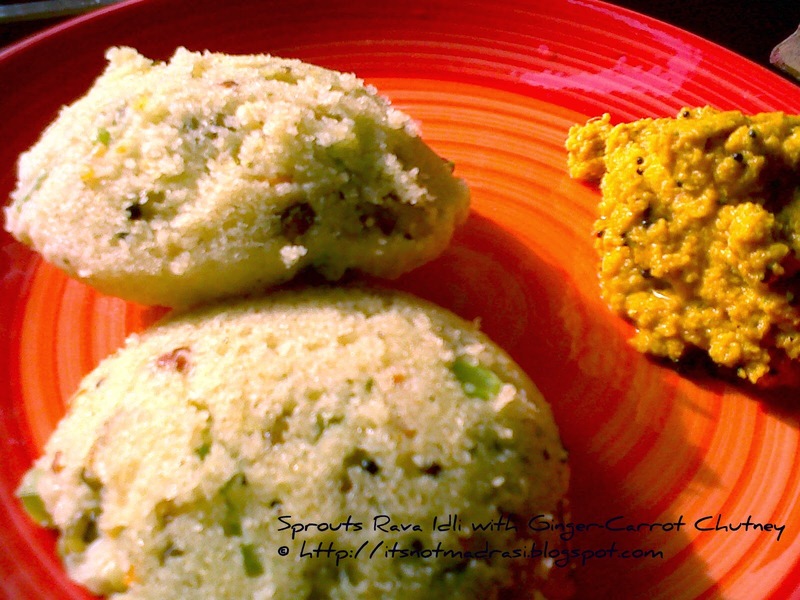 Day 2 of Blogging Marathon saw me dishing out Sprouts Rava Idli with Ginger-Carrot Chutney for a combo meal. Adding some sprouts + boiled veggies upped the health quotient of this meal quite a bit, and perfect for snack boxes and No Oil cooking options or even for breakfast.. Let's proceed to the combo dish, shall we ? Frankly, this was my first shot at using Feta Cheese, especially in a sandwich. I was quite apprehensive on how it would turn out , but it did, fantastically at that !! Loved the salty cheesy combo with freshly grated carrots, and I must say it was quite a sellout even with mom who detests bread of any kind ! Am quite confident about using this cheese, and although I am still looking for stores that sell tortillas around where I live, with which I could use some more feta. I guess this with added spinach can be served baked / stove top with chapatis as a roll too .. ummm... that's an interesting lunch box snack. 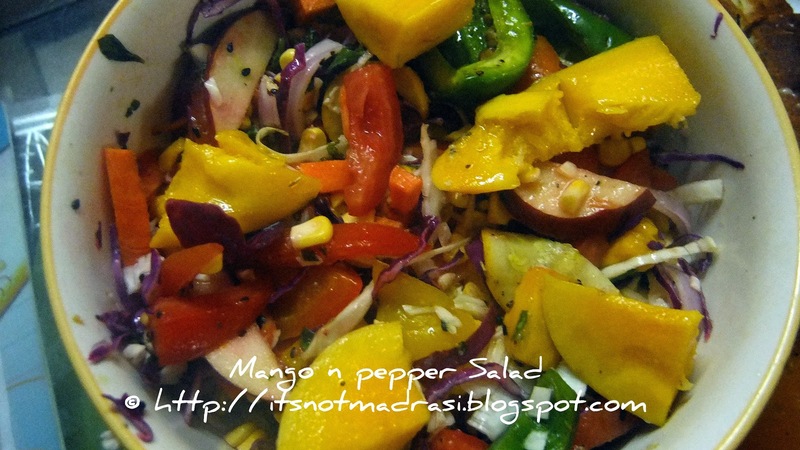 Having chosen Combo meals for Blogging Marathon , I served this with Mango-Pepper Salad for Day 1 of the Blogging Marathon. 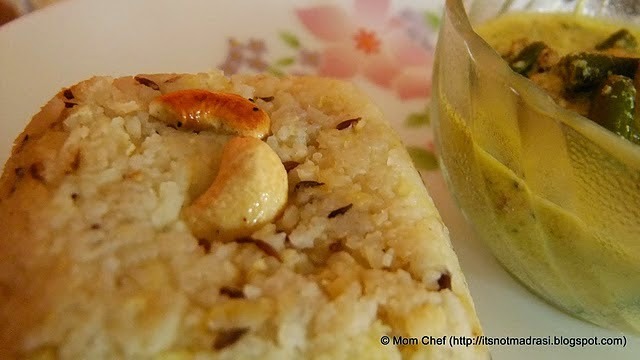 Ok, now that the 'health meter' is ringing loudly at home , am looking for ways to use up the Oats lying for soooo long in my pantry and made Oats Kharabhath. 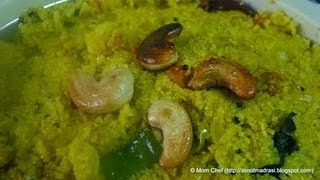 Kharabhath is 'kannada food' slang for savoury Upma with Sambhar Powder. 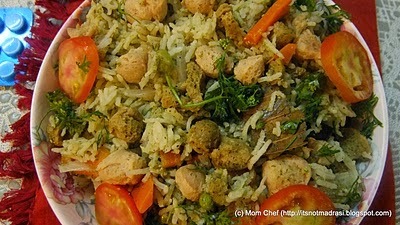 If you prefer, you may make this sans this spice powder too, and you would get the normal upma taste. This was lying in my draft to be posted for the last Blogging Marathon, but somehow never got to do it.. Better late than never, I guess. I have adapted PJ's recipe as I was paired with her for the previous marathon. 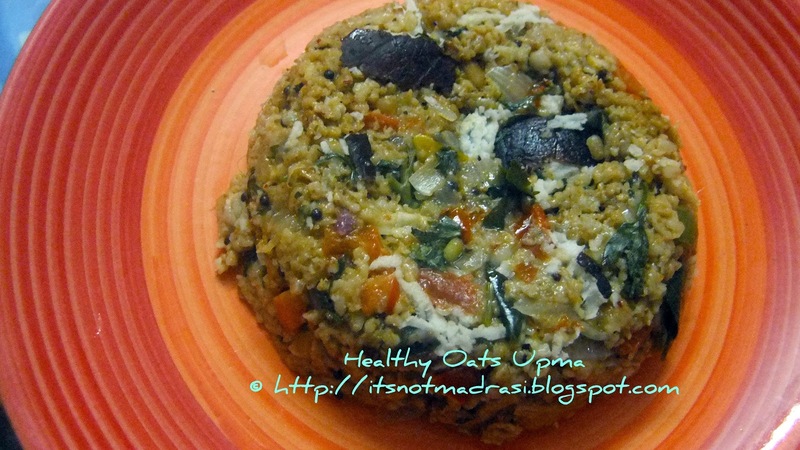 For those who like Upma and also Oats, this is a great option, and a healthy one at that, for breakfast or even for dinner as an One Pot Meal. But for people in the 'no like' category for either ingredient, this is something that will be an acquired taste. 2) In a non stick pan, add oil. Splutter mustard, urad dal, hing, curry leaves, turmeric and green chillies. 3) Then add onions and fry well. Once translucent, add salt and the chopped veggies. If the veggies are not previously blanched, add 1 cup of water. Cover and cook for 5 - 8 mins till done. 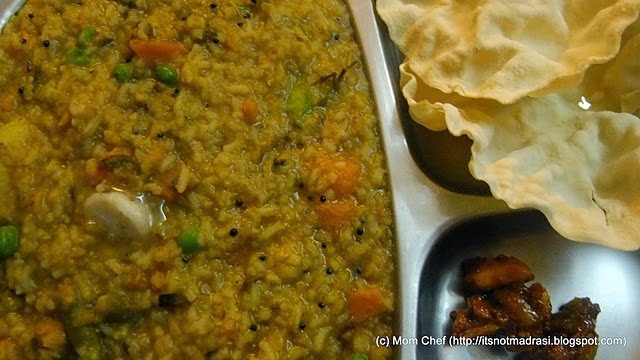 4) Now add the sambhar powder and the Oats. Cover and cook. Check if you need more water (may be 1/4 cup at this stage). Cook till Oats and veggies are done. Garnish with coriander. Take off the stove and add lemon juice and serve hot with chutney/ chilled curd or just as it is. 20 lip smacking entries to the first edition of My Mother's Kitchen (MMK) - One Pot Meals :) Am surely impressed, although am sure there are a hundred more in the blogosphere with you lovely bloggers..
R & R’s space Tadka Pasta had this fiery n spicy Pop’s Peppery Chilli to go with Makai Rotis – now who could resist that?? Vaishali’s Broccoli and Bean wrap and Veg-Corn Handvo are perfect ‘mini meals’ for snackboxes and lunchtime too ! One Pot Meals from my own space "What's cooking?" Two more dishes that I received were not exactly One Pot Meals. But I have included them in the round up as well. 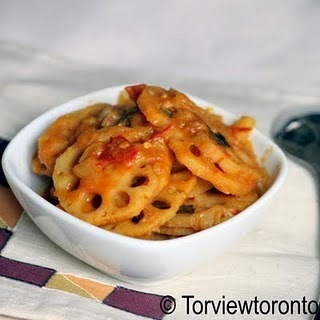 Akheela of Torview Toronto has sent this delectable Lotus Root Curry that goes well with steamed rice ! 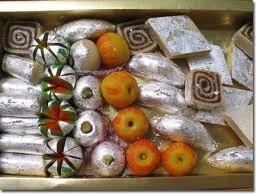 My Mother's kitchen # 2 : Indian Mithai Mela - send in your sinfully sweet entries.. Even archived entries linked to this announcement are accepted !! Do earmark all your entries as MMK - Mithai Mela while telling your blogger friends a line or two why the dish is your favourite. learnt or bookmarked from mom / Mother in law/ friends / magazines to this announcement. 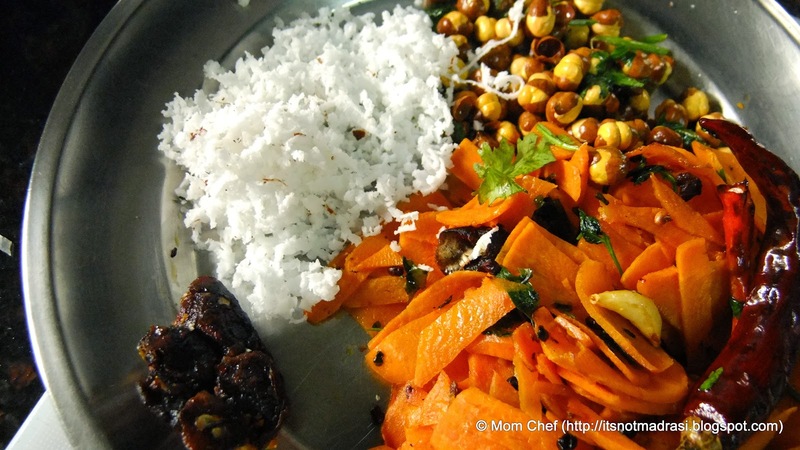 Kootu (Tamil = coming together) is a Tamilnadu dish with main ingredients being vegetables and dal (lentils) and therefore rich in proteins and vitamins. Of course, there is the faux pas of even Thovve (just dal + vegtables) being called Kootu. As S says, if its not sambhar or rasam, it has to be Kootu. Earlier on, I used to address to correct this issue, but now let it pass - after all, what is palatable is what counts, nomenclature be shifted to the back burner. 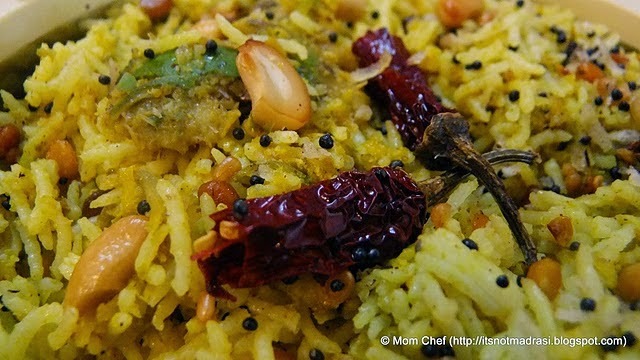 Today's dish, Arichivitta Kottu is a staple dish that goes well with Rice or chapatis alike. 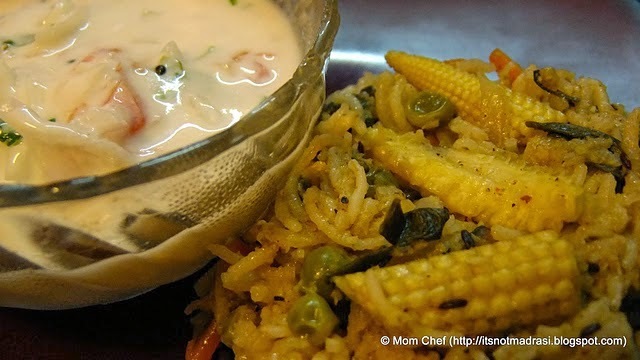 Any vegetable can be added to this (barring of course, Lady's finger /brinjal etc), this medley of vegetables can be had in the Kurma form (with onions / garlic / ginger) or today's dish with more saatvic ingredients of black pepper, Urad dal and cumin freshly ground. 1) Wash and par boil all veggies in a pan of water with a pinch of salt till 3/4 cooked but not mushy. 3) In a pan, add 1 tsp of oil and gently fry all ingredients of masala (excluding coconut) one by one till Urad dal is browned and other ingredients leave out a gentle nice aroma. Grind with coconut to a smooth paste. 4) In a deep bottomed pan, prepare the tempering. 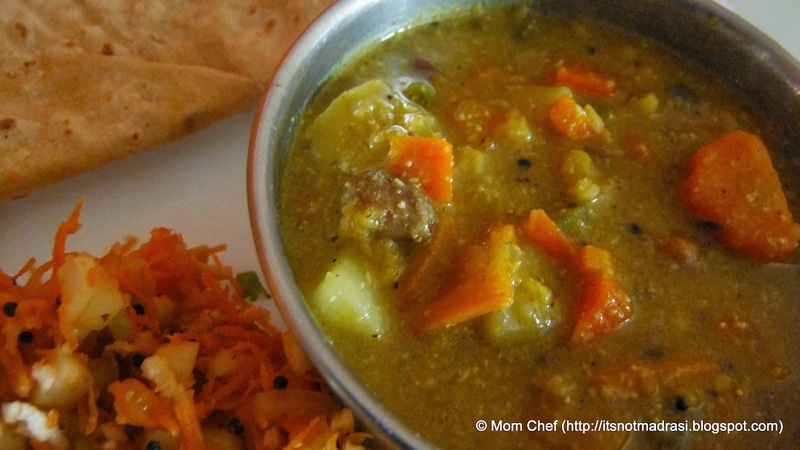 Add the boiled dal, ground spice mixture, salt, and the veggies and let it simmer covered on a gentle boil for 3 - 6 mins. 1) You may add any medley of vegetables to this curry. I have even added a handful of boiled jackfruit seeds and 1 chopped potato to enhance the taste. Shall we go to today's recipe then? Eaten primarily with Steamed rice and sesame oil, you may have it even with Dosa / Idli . 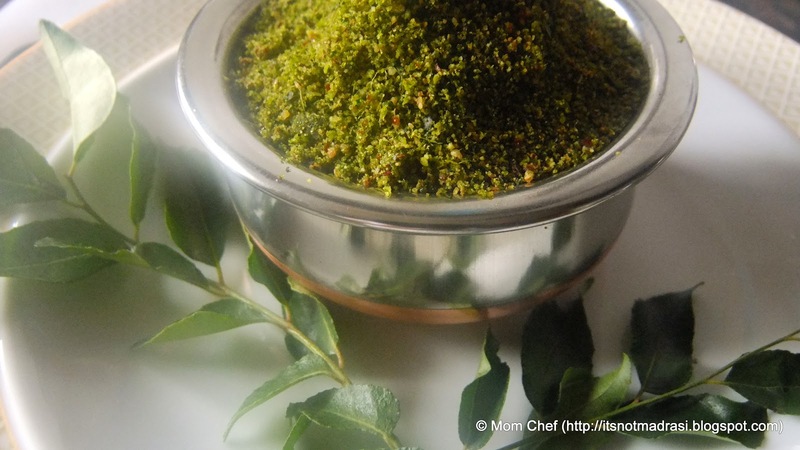 Takes under 20 minutes to prepare about 100 gm of this podi (Spice Powder). Only precaution is to wash and dry the leaves thoroughly before roasting and grinding it, else its shelf life will be drastically reduced. Prep time : 10 mins. Grinding time: about 10 mins. Makes :approx 100 - 150 gms. 1) Wipe the leaves with a soft white damp cloth and immediately with a dry cloth. If you are washing the leaves, ensure ALL water drains off and they are perfectly dry and clean. 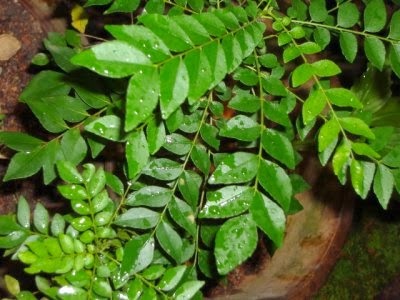 2) In a pan, heat 2 TBSP of oil and fry these curry leaves in batches (with stalks if you are using them) thoroughly in the oil till they are crisp to the touch. Add 1 or 2 tsp more oil if required. Transfer and cool in a plate. 3) In the same pan, heat 2 TBSP more oil and fry the Urad Dal, Channa Dal, Tamarind, Red chillies one by one till the dals are golden brown. Cool. 4) Now turn off the hot pan and dry roast the grated copra / dry coconut without any oil for 1-2 mins till they turn slightly brown and crusty. 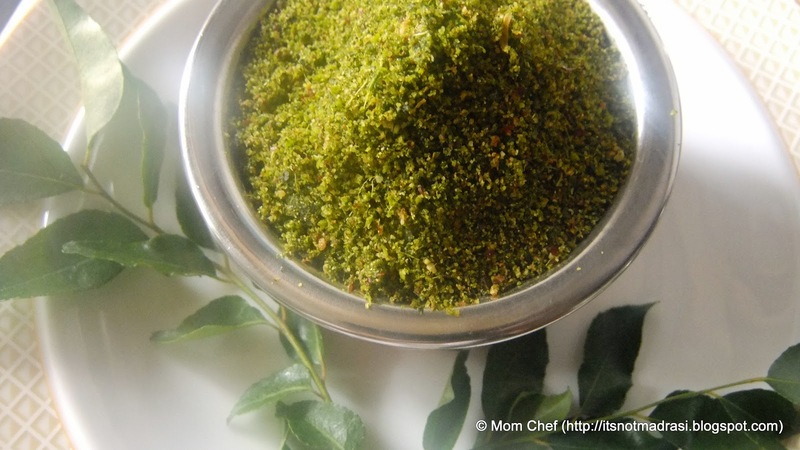 5) Now, dry grind all the ingredients except coconut in a spice mixture. Add salt, jaggery and hing and grind once more. You may prefer the final texture to be coarse or smooth. 6) Now add the roasted coconut and grind just once, else the oil from the coconut will seep into the mixture and turn it slightly soggy. 7) Check for salt. Cool and store in an airtight glass jar ! 8) Keeps well for 4 - 5 weeks without refrigeration. 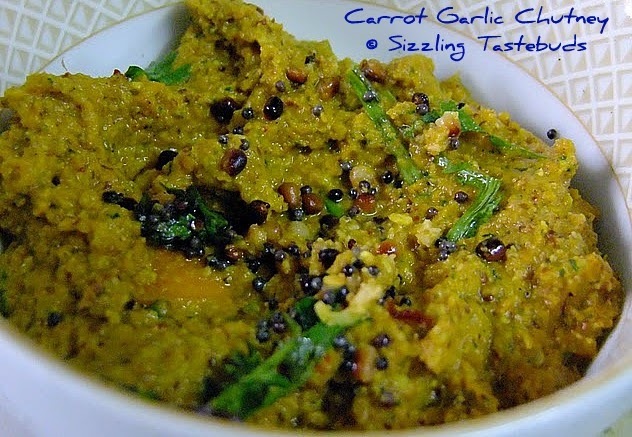 One of the first dishes that got exported from Sailu's Food into my kitchen was this spicy and tasty Carrot Garlic chutney -she is one of my favourite food bloggers and both her writing and Andhra preparations appeal to me :) This dish - Carrot Garlic Chutney - is a favourite in my family and I make this often with Dosa / Adai and use the rest to spread it on bread to make a sandwich etc. Its a lovely scrumptious chutney, and tastes great with hot steamed rice and ghee too :) Loaded with the goodness of beta carotene (from carrots) and Vit B12 from the Pottu Kadalai (fried gram), this also helps me cut down the coconut required for any chutney. In fact, I have made this with no coconut at all many times in the past without compromising on the taste. Carrots - 1 large (do not discard the peel) - cubed fine or wafer thin slices. 1) In a small pan, add 1/2 tsp of oil. Fry garlic and carrots (and washed peel) together till it leaves a fine aroma. Transfer and cool. 2) In the same pan, add another 1/2 tsp of oil, fry methi seeds, green coriander, red and green chillies and tamarind taking care not to burn the methi seeds. Cool and add fried gram and stir once more. 3) Dry grind ingredients from step 1 and 2 above with salt, jaggery and coconut. Now add very little water and grind to a a chutney consistency - this is thicker than the usual runny coconut chutneys. Transfer to serving bowl. 4) Check for salt. Prepare tempering with the ingredients. Pour on the chutney and serve with Kanjivaram Idli / Dosa / Adai / Akki Rotti or just lap it up with hot steamed rice and ghee !! Slurp ! !